About 25 years ago, we hosted a friend who’s a great wine connoisseur for a couple of weeks in Lisbon. He tried Portuguese wines from different regions and always had something nice to say. But we noticed that his enthusiasm for these wines paled in comparison to his passion for the French wines that filled his cellar. The wine that so impressed our oenophile friend was a 1969 Viúva Gomes. Its origin goes back to 1808, the year when José Gomes da Silva built a cellar in the village of Almoçageme to produce wines in Colares, near Sintra. The tiny Colares region is home to two unique grape varietals: the white Malvasia and the red Ramisco. These grapes survived the onset of phylloxera in the 19th century because they are planted on clay soils covered with sand that protected the roots from the deadly bug. After Gomes da Silva died, his widow and sons continued to produce wine which they sold under the label Viúva Gomes (viúva is the Portuguese word for widow). Their company was sold in 1920 and resold in 1931. By 1988, it was once again up for sale. It was then that José Baeta seized the opportunity to buy the vineyards, the cellar and a treasure trove of vintages going back to beginning of the 20th century. We knocked on the door of the 1808 cellar and soon José Baeta came to greet us. Visiting this building full of old bottles and ancient wine barrels made from precious woods is a voyage into the 19th century. José spoke with great passion about the unique character of the Viúva Gomes wines. We sampled a wonderful 2016 white Malvasia that is exuberant, with hints of salt from the Atlantic Ocean. We then tried a red Ramisco from 2009. It is an alluring, intense wine with notes of dried cherries. While most wines pale in the presence of food with bold flavors, the Viúva Gomes Ramisco holds its own and helps the meal sparkle. Only 2,000 bottles of white and 4,000 bottles of red are produced every year. “I always run out of wine to sell before the year ends,” says José Baeta. With the help of his son Diogo, José is trying to expand his production, finding the right soils to plant more vines. Drinking a bottle of Viúva Gomes is an extraordinary experience. These are nectars made from the rarest vines, caressed by the Atlantic winds and guarded by millions of grains of sands. The cellar of Viúva Gomes is located at Largo Comendador Gomes da Silva, 2 Almoçageme, Colares, tel. 219 290 903 and 967 248 345, email info@adegaviuvagomes.com . Click here for the Viúva Gomes website. The most poignant monument in Sintra is not a palace or a castle. It is the Convent of the Capuchos, also known as the Convent of the Holly Cross. Founded in 1560, it is a place where monks lived a life of frugality and contemplation. Long before architects designed buildings in harmony with their surroundings, this convent was built to blend into the landscape of the Sintra mountain. Made primarily out of rock, its interior is lined with cork to offer some protection against the cold and dampness of Winter. We wonder how the monks experienced the passage of time. Did time pass slowly in tiny droplets of interminable minutes? Did their minds transcend the discomfort of the body to find richness in the life of the spirit? The recipe for Sintra’s queijadas was created in the 13th century by friar João da Anunciação at the Penha Longa convent. We know that the voluptuously thin crust is made with flour, lard, water, and salt. And that the indulgent filling has requeijão (a ricotta-style cheese), egg yolks, and two ingredients added in the 15th century: sugar and cinnamon. Each pastry store in Sintra has its own secret version of the recipe. What are the best queijadas in Sintra? We’ve been pondering on this question for years, but the answer still eludes us. When we try the queijadas at Piriquita, we think nothing can be better. But then we taste the queijadas from Pastelaria Gregório and we fall in love with the crispness of the shell and the sweetness of the filling. Lately, we went to Casa do Preto and were astonished by the harmonious marriage of filling and shell. One thing we know: these queijadas lift our minds above everyday concerns and fill our souls with sweet satisfaction. Thank you friar João! Casa do Preto is located at Estr. Chão de Meninos 40, in Sintra, tel. 21 923 0436. The road to Sintra is paved with sweet temptations. We stopped for a coffee at Pastelaria Gregório and couldn’t resist eating one of their travesseiros (pillows). They were still warm, the layers of dough fusing with the rich almond cream. Our palates were so delighted that we asked for a queijada, another classic Sintra pastry. A plate with several miniature queijadas arrived and, although we tried, it was impossible to eat only one. Gregório Ribeiro started producing and selling these wonderful queijadas in 1890. The business continues to be in the family. Gregório’s great-grandchildren work at the pastry store, making sure that the quality is exceptional, baking the pastries in small batches so that everything is fresh out of the oven. There was a constant flow of regular customers who came in for their favorite sweet treats: almond tarts, bolos de amor (love cakes), broas de mel (honey cakes), and much more. We asked Teresa Matos, the owner of Pastelaria Gregório, whether they’re always this busy. “Is the cake really worth the wait?” we asked. “You need to decide for yourself,” said Teresa with a mischievous smile. In December we’ll be waiting in line to find out. Pastelaria Gregório is located at Av. D. Francisco de Almeida 33/35 in Sintra, tel. 219-232-733. Colares is the plural of colar, a word that means necklace. It is a fitting word to describe this region that surrounds Sintra with beautiful views and delicious food. 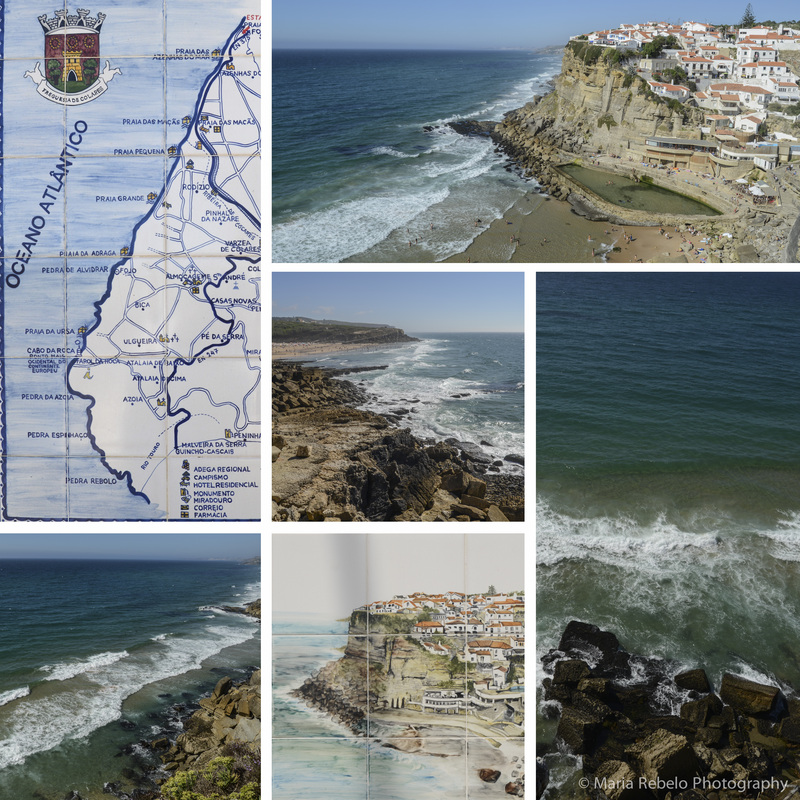 Adega das Azenhas is located on the main road that crosses Azenhas do Mar (Avenida Comissão de Melhoramentos, 5), tel 21-928-1357.